Cookstown had a brilliant post-Christmas 8-1 win over Portadown Men’s Hockey Club in the first leg of the Anderson Cup at Steelweld Park. 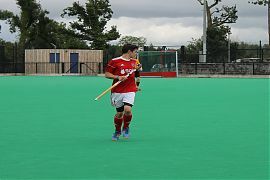 “After such a long period off, the lads were really chomping at the bit for some competitive hockey,” said Cookstown skipper, Greg Allen. The Reds started well and several chances fell to Greg Allen but he was unable to convert. Nonetheless, they got their first goal of 2019 after Ryan Millar won a penalty stroke. Allen calmly converted. The early goal settled Cookstown and they piled on the pressure. Stuart Smyth finished with a beautiful upright reverse to make it 2-0 before Portadown had a good spell of possession leading up to half time. Josh Anderson was equal to all their attempts. A fast counter-attack move from Cookstown saw Raymond Miller make it 3-0, the Stewartstown striker’s first after a series of long term injuries. Stewart Wylie was causing untold damage to the Portadown defence from numerous runs from left back. The visitors started the better of the teams after the break and controlled the opening five minutes, but Cookstown finally got back into their rhythm and passed the ball around at a very high pace. The fourth goal came through a Stu Smyth counter, his fierce reverse stick shot into the bottom corner. Miller got his second of the game shortly after this when he pounced on a loose ball in the circle. After many short corner attempts Cookstown finally converted when a routine was coolly finished by the Lough Fea man, Mark Crooks. Portadown got one back when a break down in play saw the Blues go one-on-one in the circle with Anderson. After the initial save the ball was put away on the rebound. With 10 minutes to go Cookstown extended their lead with goals by Michael Kerr and Callum Anderson after very impressive play to get into the circle. The second leg of the round will take place at Eden Villa in Portadown on Tuesday evening and, should Cookstown win, they will play Newry Hockey Club on Saturday. The win of the weekend went to Cookstown Ladies who travelled to top of the league Annadale Hockey Club in Senior 2 on Saturday. Having lost out by 4-1 at home to the same side in 2018, Cookstown were underdogs but they proved that when they get the little details right they can be more than a match for any team. They started the match at pace and Leanne Johnston got rewards for the team’s hard work, scoring in the first half. Unfortunately, they couldn’t hold out and conceded before the short whistle. The team refocussed during the break and emerged with new purpose. Jessica Greer was the match winner, scoring off a short corner. “We redoubled our efforts after that score and really got stuck into our defensive roles,” said Captain Claire McCammon. “It was such an excellent effort to keep a team as good as Dale at bay for the rest of the game. Cookstown II replaced Banbridge Hockey Club III at the top of JL1 with a hard-fought victory at Havelock Park. Stevie Allen smashed two excellent goals in the opening 20 minutes before Bann fought their way level. But that it where the déjà vu ended as Cookstown did not repeat their League Cup semi collapse but kicked on to win thanks to a brave Alan Carson finish at the keeper’s feet. Cookstown III also went top in JL2 thanks to three points from an thirteen-goal maelstrom against Instonians Hockey Club at Steelweld Park on Saturday. Gareth Cuddy and Davy Kane both continued their impressive goalscoring records, hitting two goals each in the 8-5 win while Paul Johnston and Graeme Black both converted. Mitch Greer made his long-sought return from a serious knee injury with a brace of goals too. Cookstown IV had a season-changing win at home against JL3 leaders Northern Ireland Civil Service Hockey Club III on Saturday to lift them off the foot of the table. Robert Turkington scored twice while the returning Steven Stewart also got a deserved goal to give them a marvellous 3-2 win.